Cash-strapped Greece has maybe given up hope that the EU will solve its financial woes, and is seeking direct handouts from benevolent donors via its central bank website. The bank set up an account called ‘Solidarity Account for Repayment of Public Debt’, which has been open for contributions since March 5. The account will accept “voluntary deposits, to be used exclusively for the repayment of Greece’s public debt" according to the bank's website. While Mr Tsipras isn't saying what's left in the bank, he acknowledges Greece is facing "liquidity pressure." The country's cash shortfall is projected to hit €3.5 billion in March, according to Bloomberg calculations based on 2015 budget figures. 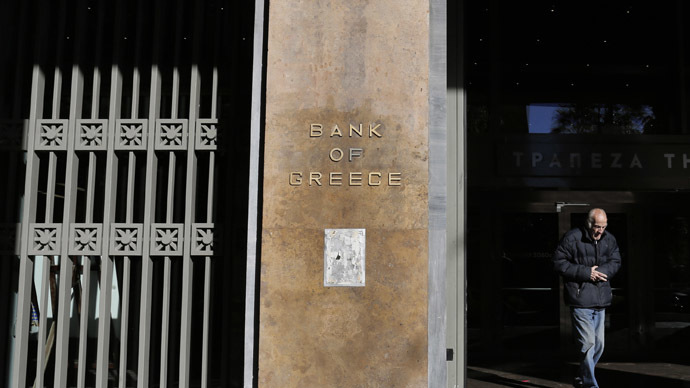 Greece’s coffers are spread thin, but the country has €3-4 billion in buffer cash stored at the Bank of Greece that could be used at a pinch, according to Economy Minister George Stathakis. By the end of March, Greece needs to pay the IMF a total of €1.5 billion, €350 million of which is due on Friday. Bloomberg estimates the country is facing a €3.5-billion cash crunch in March. This projection is in line with reports from Greek banks stating they have seen the highest spike in bank withdrawals in the past month. Leaders from Greece are trying to strike a new deal with their EU creditors – the International Monetary Fund, the European Central Bank, and the European Commission. The Troika of lenders is still waiting for Greece to present a list of reforms before dolling out any more cash. Greece owes its EU creditors €240 billion. However, the new leftist Syriza leadership has gone head-to-head with EU finance ministers over the conditions of the bailout, which the Greek finance minister has bluntly called"asphyxiating", even likening Athens to a "debt colony" of the EU. Germany has been the biggest obstacle in Greece pushing through negotiations, with the finance minister even openly blaming Greece for its own failed banks. The Greek government doesn’t want to extend its bailout package with the EU, but at the same time needs money to keep the country afloat. The bailout, along with Greece’s massive €316-billion debt, has kept Greece in recession for more than six years. Unlike other countries bailed out by the EU, Greece has failed to reverse crippling unemployment or stunted growth, which has contracted 25 percent since 2010. The EU was forced to come to Greece’s rescue in 2010 and 2014 with two bailouts totaling €240 billion. If Greece had gone rogue and defaulted, the turmoil would have spilled over to the then 18-member euro currency bloc. Very little progress has been made between Athens and Brussels since both parties agreed to extend Greece’s bailout by four months.